Laura Elizabeth Dern (born February 10, 1967) is an American actress. She is the recipient of several accolades, including four Golden Globe Awards and a Primetime Emmy Award, and has been nominated for two Academy Awards. Born to the actors Bruce Dern and Diane Ladd, Dern began a full-time acting career in the 1980s with roles in the dramas Foxes (1980) and Mask (1985). She went on to collaborate with David Lynch in several films, including Blue Velvet (1986), Wild at Heart (1990) and Inland Empire (2006), as well as the television revival of Twin Peaks (2017). Dern received a nomination for the Academy Award for Best Actress for playing the titular orphan in Rambling Rose (1991) and won the Golden Globe Award for Best Actress – Miniseries or Television Film for the 1992 film Afterburn. She established herself as a Hollywood leading lady with a starring role in the adventure film Jurassic Park (1993). In 1997, Dern guest-starred in the "Puppy Episode" of the sitcom Ellen, in which Ellen DeGeneres publicly came out. Following roles in such films as Citizen Ruth (1996), October Sky (1999), and I Am Sam (2001), Dern won the Golden Globe Award for Best Supporting Actress on Television for portraying Katherine Harris in the television film Recount (2008) and the 2012 Golden Globe Award for Best Actress in a Musical or Comedy Series for her role as Amy Jellicoe in the HBO series Enlightened (2011–2013). Dern continued to take on supporting roles in several successful films, including The Master (2012), The Fault in Our Stars (2014), and Star Wars: The Last Jedi (2017); and she received a nomination for the Academy Award for Best Supporting Actress for the biopic Wild (2014). 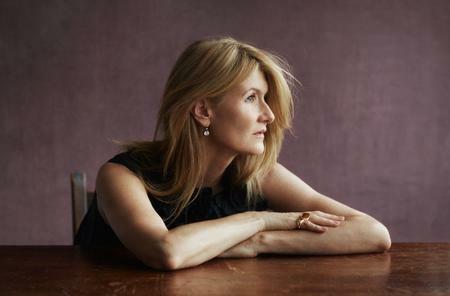 Dern won the Primetime Emmy Award for Outstanding Supporting Actress in a Limited Series or Movie and received another Golden Globe for her role as Renata Klein in the HBO series Big Little Lies (2017–present). Dern is an activist for raising awareness about toxic substances that can affect children's health. She is also a supporter of various charities and an activist for Down syndrome awareness.